There aren't any government bonds to buy other than the U.S. Both Treasury and high-yield bonds seeing falling market-driven rates means that the interest rate spread between high-yield bonds and Treasuries has stopped falling and is moving sideways. The strength of the high-yield market certainly suggests the economy is doing fine, despite this soft patch. The relentless bids in the U.S. Treasury market continue, with the 10-year Treasury yield closing last week at 2.41%. Given the fierce rebound in the high-yield market – with key high yield ETFs trading at fresh 52-week highs – I would have expected “risk free” investments like Treasuries to have higher yields but the global economy is much weaker than the U.S. economy and the U.S. offers the highest interest rates of any developed market. Simply put, there aren't any government bonds to buy other than the U.S.
My experience tells me that a strong high-yield market means a strong economy. 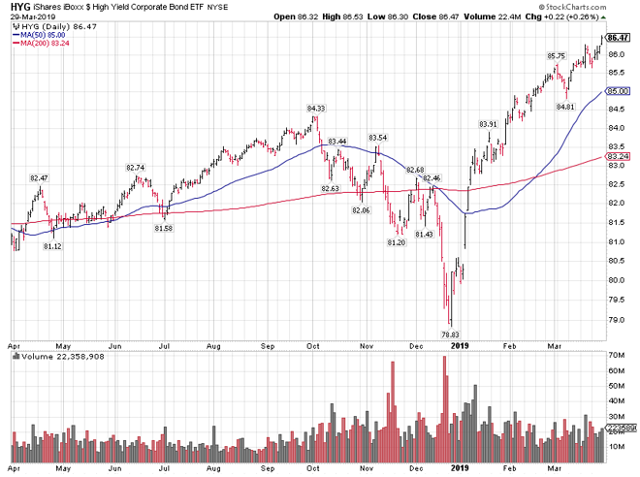 By the looks of the largest high-yield ETF, the economy is doing fine. I know that the technical inversion of the 10-Year Treasury trading below some short-term interest rates has raised some eyebrows, but this is not a real inversion, as the more closely-watched 2-10 spread is still positive. The technical inversion stems from the fact that both 10-year German bunds and Japanese Government Bonds (JGBs) are in negative territory so the 10-year Treasury is being pulled lower by negative interest rates in the other key global markets. 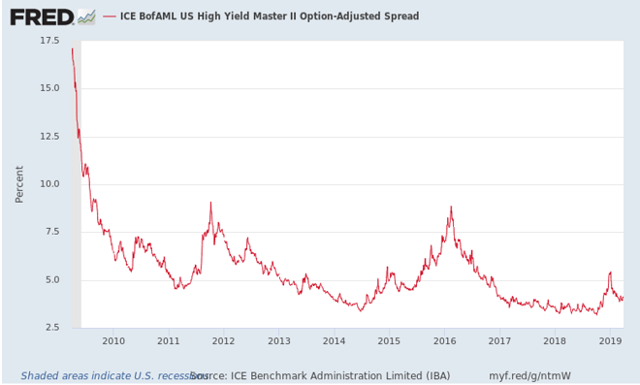 Both Treasury and high-yield bonds seeing falling market-driven rates means that the interest rate spread between high-yield bonds and Treasuries has stopped falling and is moving sideways. At 408 basis points (4.08%) the junk bond composite is 100 basis points lower than when Mr. Trump was elected President. I know that the economy has slowed some from the first sugar high of the Trump tax cuts, but this was to be expected. If we follow the pattern of the Bush tax cuts of 2003, there will be a sugar high, a pause, and then a second leg up in economic activity. My conversations with investors suggest that very few are looking for a second-half reacceleration in the economy, yet this is precisely what may happen next. 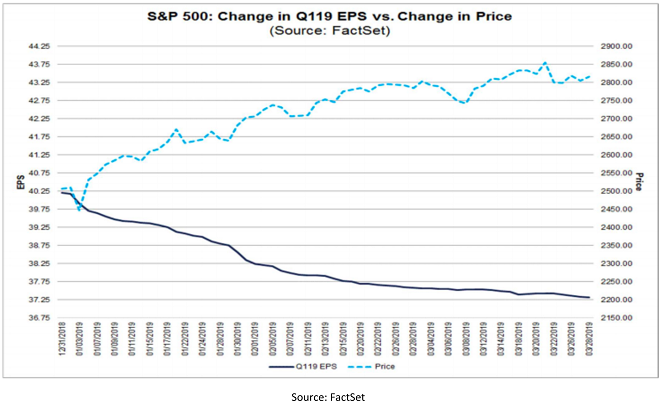 First-quarter earnings will be the first quarter since 2016 to see negative EPS growth for the S&P 500. Current estimates are to the tune of -3.9%. The main culprit was the tax cut and the much higher EPS growth rate we saw for the S&P 500 in 1Q2018 and 2Q2018 -- hence the difficult y/y comparisons. In addition to the difficult comparisons with 2018, the consensus estimates dropped rather dramatically as the quarter progressed. 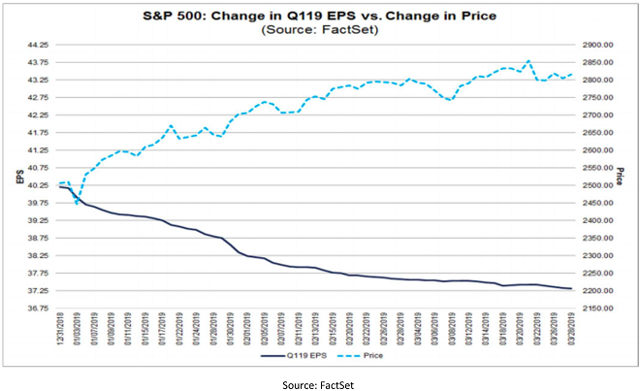 To get to the present -3.9% projections, consensus estimates were cut by 7.2%, which was much more than the typical EPS cut as a quarter progresses. As things stand at the end of the first quarter, the consensus for the full-year 2019 calls for 3.7% EPS growth and 4.8% annual revenue growth. In the brave new world of quantitative tightening – where the size of the Federal Reserve balance sheet disproportionately impacts the aggregate level of asset prices in the system – we had a situation in 2018 where better than 20% EPS growth was met with a 4.5% decline in the S&P 500 (counting dividends), so it is entirely conceivable that we could see only a 3.7% EPS gain and a better than 20% rise in the S&P 500 in 2019, as the 2018 anomaly is being reversed: The market flips around but makes modest net gains. 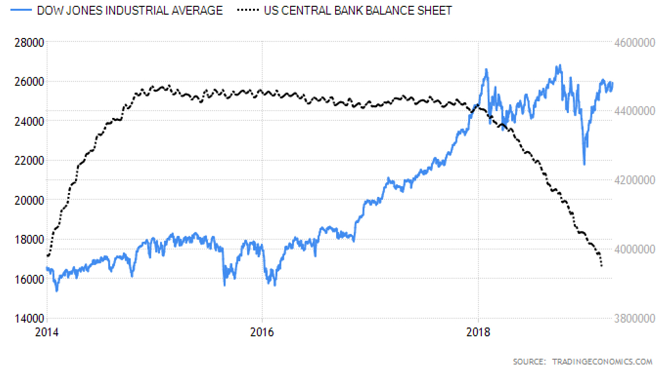 There is every indication that there won't be any rate hikes in 2019 and the Fed balance sheet unwinding will stop, as per the Fed Chairman’s own words. Still, the United States is a heavily-indebted economy and market-driven interest rates still matter. If indeed the 10-year Treasury yield is driven lower by the troubles in Germany and Japan, the bond market has already given the U.S. economy an interest rate cut with falling yields of both Treasuries and high-yield debt, which is not a combination that one sees often. I think the chances of a soft landing in the U.S. economy are very high, similar to what we saw in the mid-1990s under the Greenspan Fed. Chinese economic data has again perked up, with every indication that a trade deal is near completion, so I suspect that the present EPS estimates for the S&P 500 may be rather conservative. Consensus estimates call for a 3100 target for the S&P 500 by the end of 2019.